Callum began running ‘Rebound Therapy’ sessions at weekends in Stirling during August 2016 after having worked as a Support Worker and Programme Coordinator for children and adults with Autism and other disabilities for nearly 5 years – both in Scotland and at a summer camp in New York, USA from 2012-2015. He recognised the benefits this intervention would have to local individuals within the Forth Valley area. Whilst trying to juggle studying for his final year at GCU and running the business as a sole trader, it was clear there was a need for this service professionally. 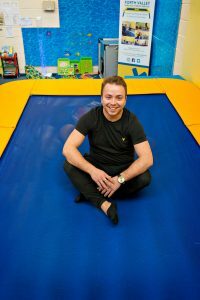 As a result, on 20th April 2017, Callum founded this service as ‘Forth Valley Rebound Therapy Service CIC’ – a legal non-profit company/ social enterprise. Now, Callum has graduated and is continuing to learn clinical and business skills to develop the service further. Due to the success of the innovative approach the service has taken since running full time, Callum rebranded it to ‘bOunceT: innovative Occupational Therapy’ in 2018. He is currently the only Occupational Therapist within the service, but does have a small team working alongside him – including Therapy Assistants who are qualified to lead sessions following the direction of an individuals Therapy Plan. In his spare time, Callum enjoys travelling – especially abroad! He makes time for friends and family, enjoys going to the gym and swimming. He loves his car and even got a private registration for it – OT08 CAL!